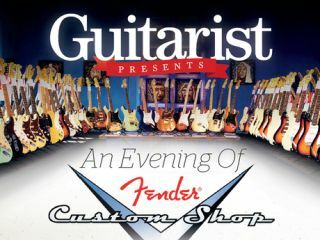 Last chance to buy tickets to our Fender Custom Shop event! Win a Fender Custom Shop '60 Strat Relic on the night! There's still time to purchase tickets to our incredible one-off Guitarist Presents Fender Custom Shop special event, but not much! The ticket hotline closes at midday Wednesday 12 October, and with the event taking place the day after, on Thursday 13 October in Bath, time is running out to decide if you want to to spend the night with all those gorgeous Custom Shop instruments. And don't forget, everyone who attends the event is entered in to a draw to win a Fender Custom Shop '60 Strat Relic in vintage white on the night! With tickets extremely limited, chances of winning this stunning instrument are very good indeed - around 1 in 80! Guitarist Presents An Evening Of Fender Custom Shop will be held on the evening of Thursday 13 October at a secret, stunning location in Bath. For full details about the event, click here.